Bangkok cracks the list of the top 10 cities with the foulest air on the planet. “Gas Chamber”: United Airlines has canceled flights to New Delhi until the air gets better. 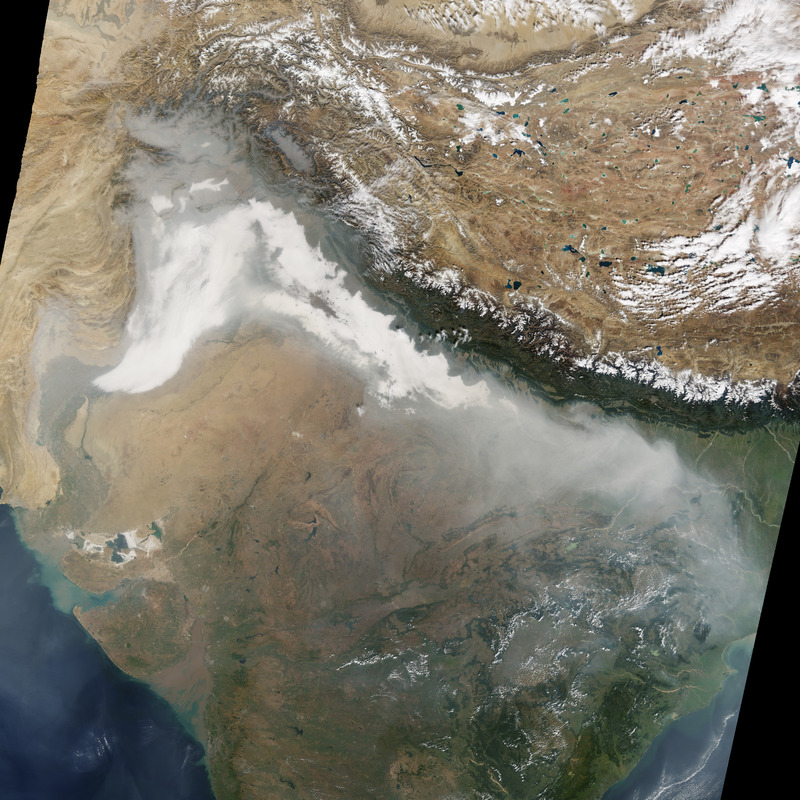 Smoke mixed with fog, dust, and industrial pollution form a particularly thick haze in northern India. 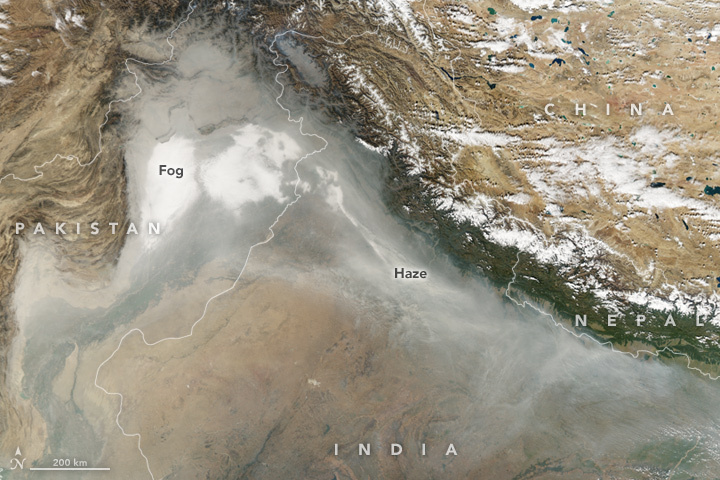 Since mid-October 2017, smoke from crop fires in Punjab and Haryana has blown across northern India and Pakistan. With the arrival of cooler weather in November, the smoke mixed with fog, dust, and industrial pollution to form a particularly thick haze. A lack of wind, which usually helps disperse air pollution, worsened the problem for several days in November. 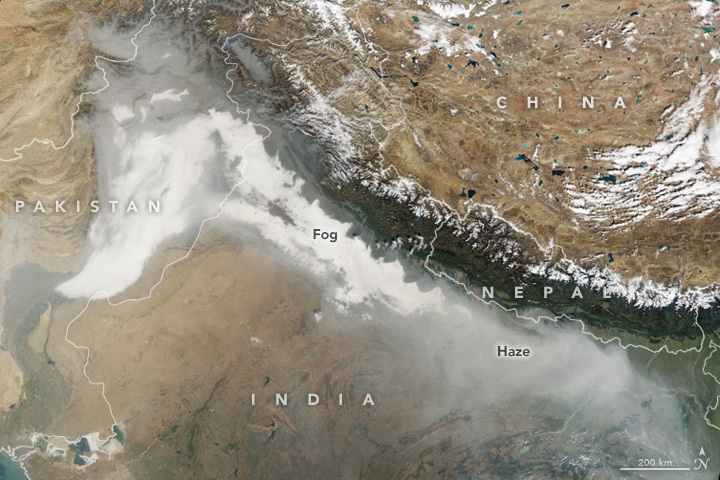 On November 7, 2017, the Moderate Resolution Imaging Spectroradiometer (MODIS) on NASA’s Aqua satellite captured this natural-color image of haze and fog blanketing the region. The second image, a data map based on observations from the same sensor, depicts aerosol optical depth, a measure of how airborne particles affect the reflection and absorption of light by the atmosphere. Red-brown colors indicate skies thick with aerosol pollution. 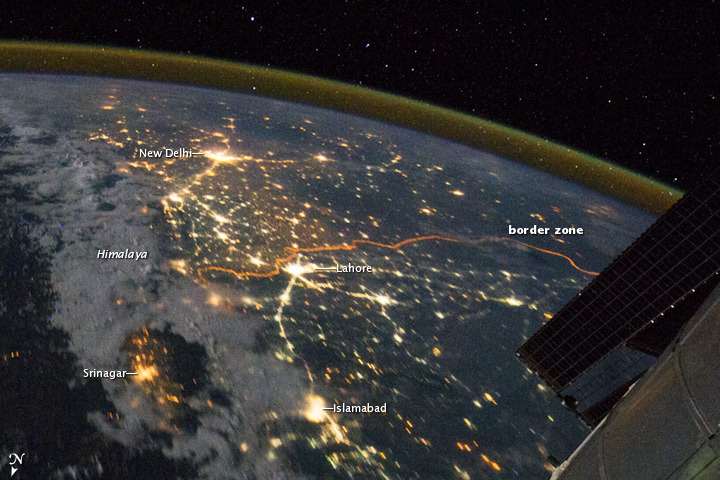 Several major cities—including Lahore, New Delhi, Lucknow, and Kanpur—faced elevated levels of pollution. As seen in the third image, which was captured by Terra, thick haze continued to linger over the region on November 8, 2017. 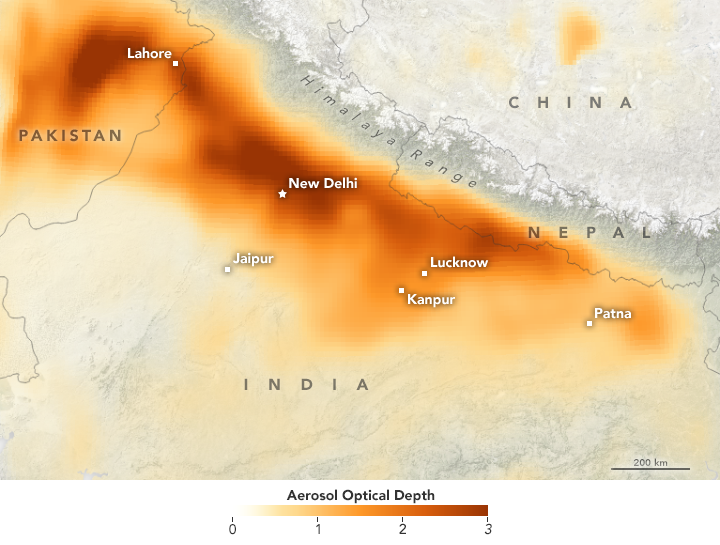 In New Delhi, particulate pollution rose several times above the limit considered safe. On November 8, 2017, an air quality sensor at the U.S. embassy recorded a peak air quality index of 1,010—an extremely hazardous level. Values of 0 to 100 are considered acceptable. In response, authorities in Delhi have closed schools, banned trucks from entering the city, halted construction projects, and increased parking fees to discourage driving. With hospitals recording a surge of people complaining of respiratory problems, the Indian Medical Association has declared the situation a public health emergency. Aljazeera (2017, November 8) What’s PM 2.5 and why is New Delhi, Lahore smog so bad? Accessed November 8, 2017. Hindustan Times (2017, November 8) Delhi air pollution prompts officials to close schools, halt construction, entry of trucks. Accessed November 8, 2017. The Guardian (2017, November 7) Delhi doctors declare pollution emergency as smog chokes city. Accessed November 8, 2017. The Tribune (2017, November 7) Stubble burning reaches new high. Accessed November 8, 2017. U.S. Department of State New Delhi — PM2.5. Accessed November 8, 2017. ** More than 5.5 million people worldwide are dying prematurely every year as a result of air pollution. ** Most of these deaths are occurring in China (coal production) and India (indoor pollution). From Jan. 1, residents of New Delhi, which had been choking in thick smog in recent days, will be able to drive only every other day according to their license plate numbers — odd numbers on one day, even numbers on the other. New Delhi’s air — a noxious combination of exhaust, dust, smoke from wood and dung-fired stoves, burning leaves and industrial output — surpassed Beijing’s last year as the dirtiest in the world, according to a study by the World Health Organization.